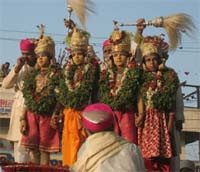 Bharat Milap is annually held on the day after Vijayadasami at Nati Imli in Varanasi. Bharat Milap 2019 date is October 9. The festival is based on the relationship between Sri Ram and his brothers in the Ramayana – Bharat Milap is the enactment (stage performance) of the reunion of Sri Ram with his brothers after a 14-year exile. A procession of the four brothers - Sri Ram, Bharat, Lakshman and Shatrughan - is a highlight of the event. Legend has it that Megha Bhagat, a disciple of Tulsidas, started the enactment after being told in his dream to dramatise the Bharat Milap. He staged the episode at Nati Imli ground and at the moment of climax, he got fainted and died. Thousands of people attend the Bharat Milap enactment at Nath Imli. Its importance can be gauged from the fact that Maharaja of Banaras miss the famous Ramlila in Ramnagar on this day to attend the Nati Imli performance. As per the tradition, children play the roles of Shri Ram, Bharat, Lakshman and Shatrughan.